Steve Abraham hosting for the night. I offered to support Steve Abraham in is quest to beat the year mileage record (What’s that? see my earlier blog) It fitted in with his support teams plans, and I ended up being the first stranger to host him for the evening in his epic quest, no pressure then! Steve was clocking up a metronomic 180 miles daily, despite the cold and very strong winds. Chipping away at that mind boggling 75,000 mile target. I had to ensure everything went smoothly. 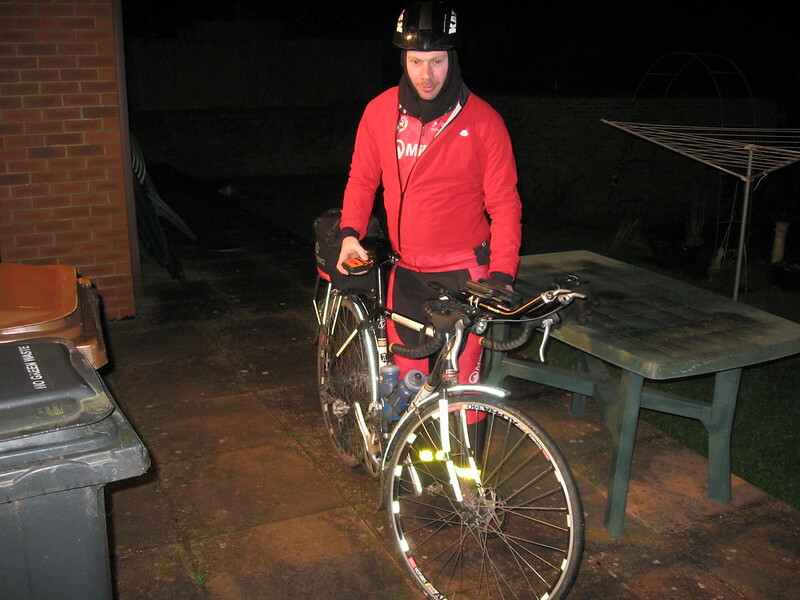 Day 13 he came to stay, arriving at my house in Northants at 8.30 pm, feeling the cold with another 180 miles under his belt. 2100 miles already was staggering (very useful spreadsheet link) and to be honest he looked wasted. As we got him inside and started the complex process of disconnecting and charging numerous battery powered devices, it was clear Steve needed coaxing to just keep functioning. Priorities in order were then the Strava upload for the record validation, big food, clothes in the washing machine, then point Steve at the shower and bed and say good night. This was no social visit, chatting just slowed the whole process down, that was to be saved for riding with Steve the next day. It was interesting to see the type and level of kit used, and hear brief details of the support received from fellow cyclists and sponsors. 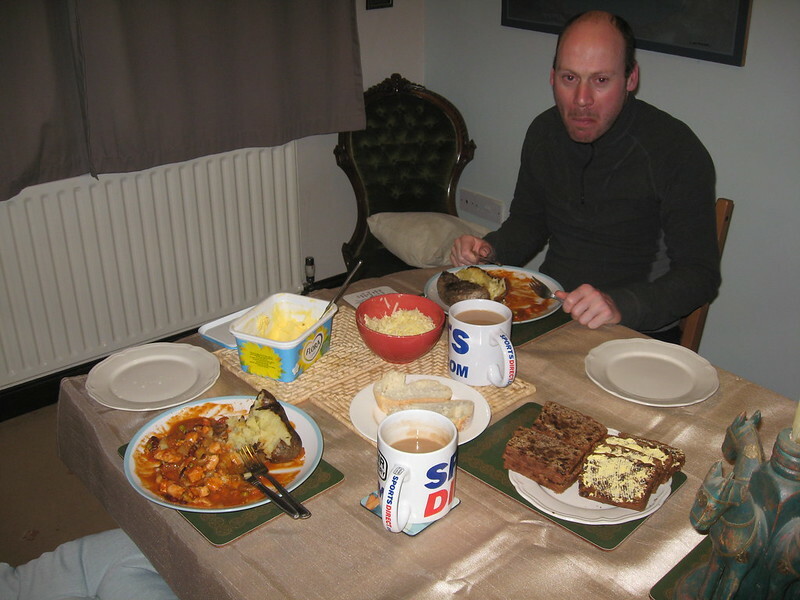 Steve didn’t eat as much as I expected, but then I have very big references compared to most people, we both enjoyed a big jacket with chilli, and two pints of tea each. The guy loves cheese and pork, we also had tons of sausages on standby. 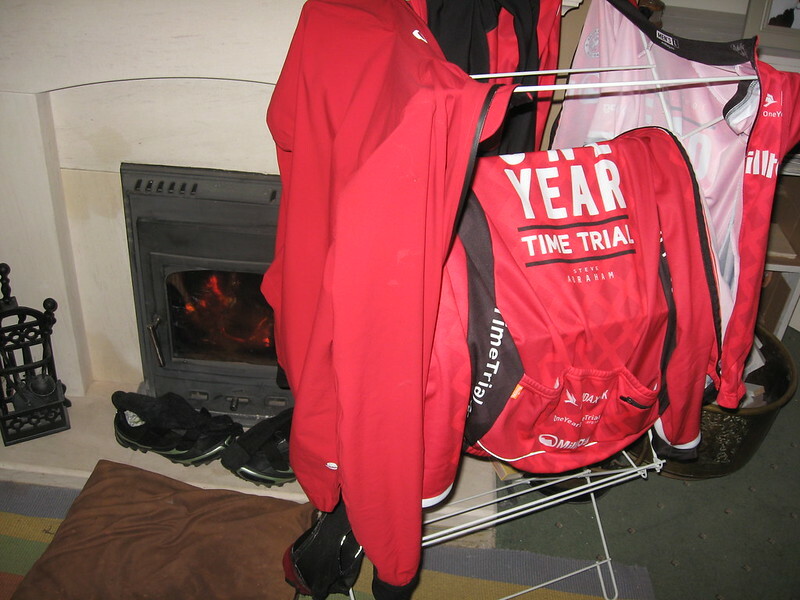 While Steve sleeps the hosts work continues, washing and drying his kit supplied by Millitag, and then some natural heat drying. I never use a tumble dryer normally and didn’t intend to start now. The bike got a quick once over, but as no issues were highlighted work was limited to a quick wipe over and visual check. The Raleigh Sojourn steel frame will be a surprise to most riders, who might think it’s a heavy budget choice for such an epic task. It shows this is not a big budget sponsored attempt. Raleigh have supplied 3 bikes and while many would think it would be stripped out and loaded with lighter parts, the bike remains pretty standard apart from subtle changes. Hope headset and bottom bracket ensure reliability there, and bar end shifters have been used on Tri bars for less hand fatigue. The biggest change is from Steve’s desire to use Schwalbe One tubeless tyres. He explained that he had struggled to get wheels built, these are his own Stans Alpha 340 rims on Hope hubs. His only pair for the three bikes so far, so come on Hope get on board here and support this British effort. 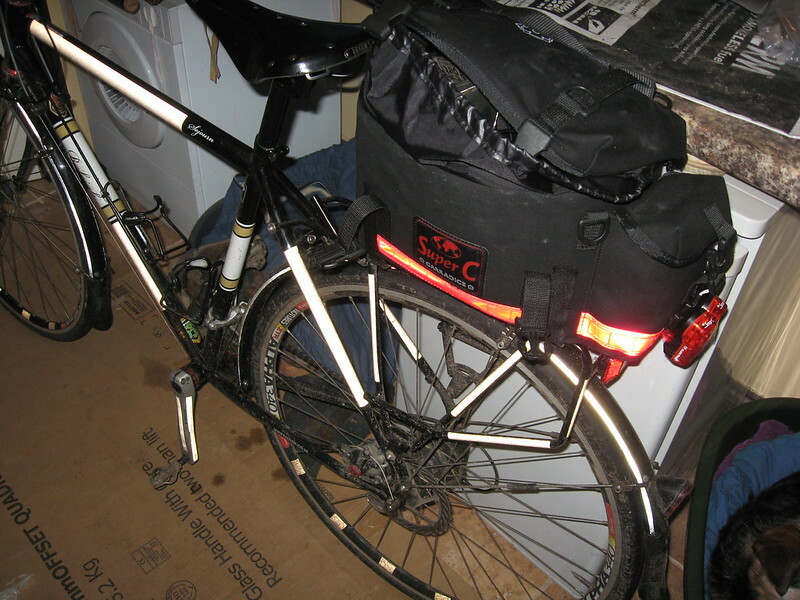 I admired the Carradice Super C rack bag it looked a very well made waterproof bit of kit, with quick easy access. It was loaded with spare kit, tyre, lock, and lights, and held the mass of spare batteries, lights and chargers carried daily. This all added to the weight penalty though. With four front lights and four Smart 1W back lights and all associated batteries, there have been many questions about the lack of a dynamo system. I’m a dynamo user and fan, but I can see the argument against where 3 wheelsets will be involved. Steve has done some amazing mileage on dynamo hubs, and has killed quite a few, so he would still have to carry back up lights. At the steady pace he is riding even the slight power drag of the dynamo adds up over all those daylight miles, and simple lights can be obtained quickly. Steve’s mission control is from sponsor Garmin. 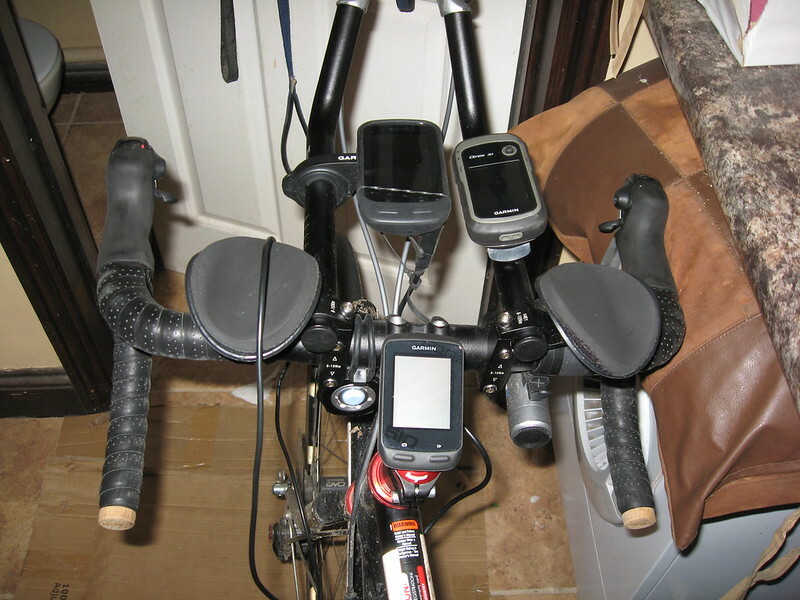 Validating the distances covered is of primary importance so three devices are logging the ride. An Etrex30 is the failsafe, using AA batteries it’s always going to be there quietly in the background. A 500 is there as a secondary tracking device while an Edge 1000 is used for navigation and primary track logging to Strava. Added to this a Spot satellite tracker (kindly arranged by TCR organiser Mike Hall) is strapped to the rack bag to provide the addictive live tracking data. The Edge 1000 (my review here) has a great screen but requires a backup battery to cope with epic rides. Steve uses the Garmin power monkey which is a neat sealed unit complete with Velcro straps to mount anywhere, but it’s proving troublesome. When are Garmin going to wake up to the fact that USB connectors and cycling outdoors do not mix! Devices get killed at a hint of moisture on the miniature pins, and the plugs fall out too easy. Today Steve has lost power and the recording on the 1000 as the plug kept falling out, and the constant wear this socket Is going to get it can only get worse. I rigged up a quick fix for him using a rubber band on the cable to hold it in for now. Please Garmin, we are not all 1 hour loop riders, let’s have a 2 pin waterproof socket to connect backup power to on these high tech devices please. After a few hours sleep I was up at 3am to start sorting and reconnecting lights and mission control, then woke Steve with a pint of tea at 4am. The day starts slowly, there’s no rush as bowls of Granola and more tea help wake the machine, legs are tired but he feels they are getting stronger daily. The offer of cooked food is declined but a lb of 97% and 80% meat sausages are greatly received and loaded into the Carradice, and contrary to instructions forget any bananas! 2 tablets into each cleaned water bottle from sponsors Nunn products sorts the hydration. It was nice to hear that my organisation meant we were out the door for his earliest start yet, being a host is greatly appreciated as Steve explained he has been quite slow in sorting everything out himself especially in the morning. Garmins reset for the day, a post to twitter sent from a button on the tracker stating the days ride had begun. It was 5am as we eased into the cold morning air for another day in the office. I’d briefly ridden with Steve the previous week, when I used the tracker to meet up with him as he passed close by in horrible conditions. Then I was bearing a flask of tea, so had an idea of what to expect ride wise. It’s great to watch his level of self control while riding, he’s wearing a heart rate monitor to validate that the rides are human powered, but rides on feel himself. A constant power approach is used, climbs are taken at a very steady pace, I think many would be amazed just how slowly! Any use of gravity is exploited to the full, Steve doesn’t do freewheeling. This approach is similar to my endurance method of riding with “no chain” just spinning the pedal’s, but even so I was impressed with the control at limiting power. 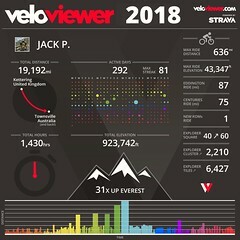 Just check the mans average heart rates on Strava. It’s not rocket science, but not many of us could replicate this level of control, or use the time available as efficiently. 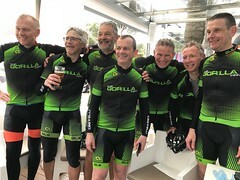 If you’d like to support Steve in his challenge please go to his website Oneyeartimetrial and find out more info; and instead of just ticking that Strava Kudos box why not donate some cash. Just a fiver is another breakfast to fuel the machine; remember Steve is running on meagre savings and has given up work for the year. 75,000 miles will burn lots of fuel, the staggering fact is he’s targeting 80,000! Keep an eye on that tracker and get out and ride with him, or buy him an all day breakfast when he’s close by. For more great information on the history of this long distance madness, I just found a great Cycling weekly piece written by Dave Barter on the history behind this race. Tommy Godwin 75,065 miles, well worth a read. When will Steve be in the North West????? I’m only a friendly hosting volunteer, nothing to do with his main team so I have no idea. He’s down to do the Mersey 24hr is that in your area, check his website diary for info of future hosts locations. An excellent report. For more information of Tommy’s record ride and the other previous holders, the book UNSURPASSED gives an insight that numbers don’t give. Great report and insight into Steve’s quest – well done for sharing this. Great report and a little insight, does he come South during the year via Portsmouth or Southampton? looks like he is down to finish in Bournemouth later this month, also he is doing the Paris Brest Paris Audax in August so I’d put money on him riding to the ferries in Portsmouth or Newhaven prior to that. I’m supporting Steve at his place next week, so found this really useful. 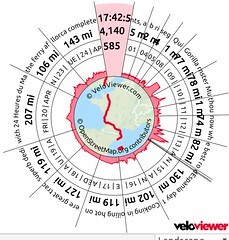 Great looking Graph on that HAMR page, but why does the official daily rides page for 26th Jan for Kurt still include the vehicle transfer that happened in the middle of that days miles The official distance should be 175.8 and not 181.9 miles, Small difference but it should be right. Make that “official-results” — we have a link on the page that includes Drew’s official spreadsheet. Drew Clark is the records chairman.